Mary Jane Perry Guy peacefully entered the presence of the Lord on the twenty-seventh of March, 2018. She was born on October 28, 1928, in Shorter, Alabama, to the late Rev. William Henry Perry and Mary Jimmerson Perry. After graduating from Cliff High School, she married the late Robert Murry Guy. They celebrated 54 years of marriage. She was employed by a local shoe store, A&P Grocery and retired from AmSouth Bank. Jane loved her Lord and Savior Jesus Christ and lived for Him from childhood. She enjoyed reading her daily devotions and was especially happy to share them with others. Through the years, Jane was faithful to serve God in the church and the community. She treasured the time she spent with her family and friends. She also enjoyed making and sending inspirational cards, cooking, baking pies and working with plants and flowers. 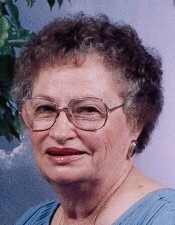 She is survived by her two sons: Robert “Sonny” Guy, Jr. (Linda); Michael Perry Guy (Belva); Grandchildren: Robert Murry Guy, III,(Tiffany); Perry Guy Wright (Gabriel); Wendy Guy Hickey (Jesse); Jonathan Nelson Guy (Anna); and Chandler Michael Guy; Nine great-grandchildren; Brother: Jim Joe Perry (Eleanor); Sister: Judi Perkins Sellers (Bob); and Brother-in-law: Roy Johnson; and numerous nieces, nephews, cousins and dear friends. Visitation will be held on Friday, March 30, at 1:00 pm at Jeffcoat-Trant Funeral Home followed by the funeral service at 2:00 pm. with Pastor Mike Wright officiating and Rick Lane providing special music. Dave Fisher, Chuck Hawkins, Sammy Laro, David Lilly, Russell Smith and Randall Willis will serve as pall bearers. Interment will be at Shady Grove Cemetery. In lieu of flowers, the family asks that memorial gifts be given to your church or New Birth Outreach Center, P.O. Box 1184, Valley, AL 36854.